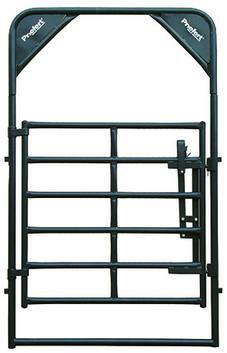 Rough Stock Bow Gates are a great option for rodeo arenas, holding pens, and crowding lanes. As the panel line of choice for the PRCA, the NFR, and the PBR, our Rough Stock Panels and accessories are unmatched in their durability. These gates each feature a Double Piston Slam-lock Lever Latch with a gravity safety latch to prevent accidental opening from something like the horns of an aggressive bull. Heavy duty fully welded vertical stays provide extra strength and stability to the gate. The 9' tall bow frame provides easy "ride thru" access. The Architectural Grade Powder Coat Finish helps the product to resist rust, scratches, and fading to add years of life to your investment.